In the current literature, more than 95% of all studies of vitamin E are directed toward the specific exploration of the bioactive component a-tocopherol. Until recently, there has been a dearth of research into non-tocopherol vitamin E molecules. 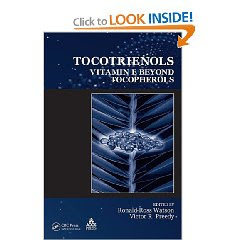 A unique resource that examines the newest developments in this area, Tocotrienols: Vitamin E Beyond Tocopherols focuses on the lesser-known vitamin E compound known as tocotrienol. Recognized as potent antioxidants, tocotrienols play a role in cholesterol reduction, tumor suppression, reversal of arteriosclerosis and protection of the heart against oxidative stress. Compiling contributions from leading researchers, this book builds upon a recent symposium sponsored by the American Oil Chemists Society. It begins with an overview of tocotrienols, and then examines their sources, chemistry and mechanisms of action. Contributors discuss the uses of tocotrienols in the prevention and treatment of cancer and heart disease, their metabolism and absorption and their potential in the treatment of infectious disease and neurodegeneration, as well as their use as a countermeasure against radiological threat. For the past 10 years, Professors Ronald R. Watson and Victor R. Preedy have published books on bioactive nutrients and dietary supplements. Professor Watson has been and is currently funded to do research by grants from the American Heart Foundation and the U.S. National Institute of Heart, Lung, and Blood. By gathering the contributions contained in this volume, they have expanded the field of knowledge and forged a new path in disease treatment and prevention.